Vitamin C in Crystal form. 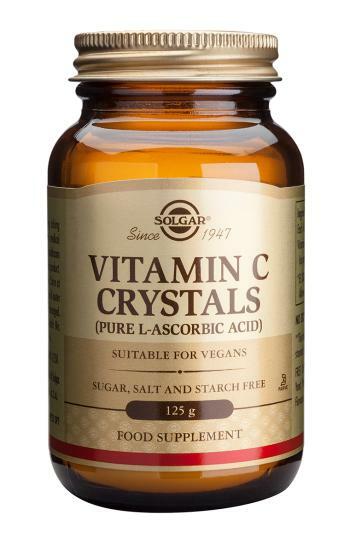 Solgar Vitamin C Crystals - Pure L-Ascorbic Acid. Each rounded teaspoonful supplies 4.5g** of Vitamin C which provides 5625% of the EC RDA. **This amount of Vitamin C may cause mild stomach upset in sensitive individuals. SUGGESTED USE: As a food supplement for adults, 1/4 to 1 teaspoonful daily, preferably at mealtime, or as directed by a healthcare practitioner. Should be added to juice or sprinkled on food. Do not exceed directions for use.